For everyone who has been wondering — why haven’t there been more Mango Power posts? 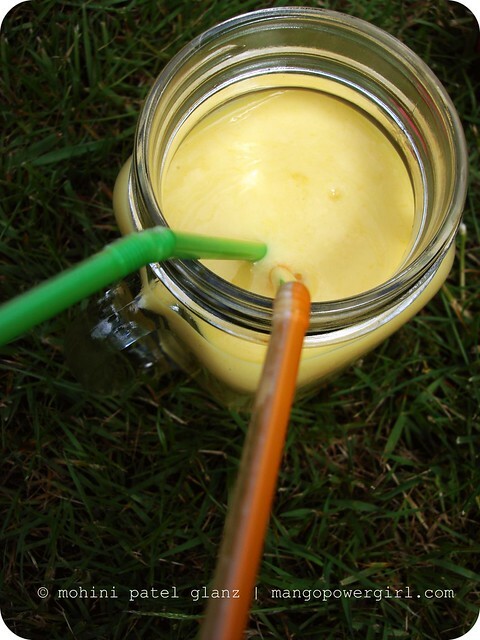 — here’s an easy one, my Mango Power Lassi! To be honest, I have been incredibly disappointed this summer because I have had a hard time finding good mangoes. There have been plenty of OK mangoes, but they are either bumped and bruised, way too expensive for my pocket, or just not the type I like to eat. One thing most people might not know if they have not lived in a mango producing region: you cannot have machines processing your mangoes. Everything must be plucked/picked/gathered/ packed by hand. Like most berries, mangoes are a delicate fruit and they bruise easily. When I do find good mangoes, I either eat them straight (not as interesting to blog 😉 or I turn them into something simple & quick, like this lassi. Last time I found a good mango I did just that! 1. Blend the yogurt and the mango in a blender. 3. Taste, then add a teaspoon of sugar if it is not sweet enough. My mango was pretty sweet, so I enjoyed it just like it was. 4. Pour it in a glass of your choice and enjoy right away! I agree MPG mangoes can be a bit like that. Your power lassi sounds wonderful. Is it traditional to put ginger in it? OMG, mangoes with cardamom and vanilla! 🙂 And on the base of a yogurt drink, I can’ imagie something fresher, tastier and more aromatic for the summer 🙂 Should try it definitely! What a delicious sounding summer drink. I bet it would freeze into popsicles well, too! This looks terrific! I always order these at restaurants but never thought of making my own with a fresh ripe mango. I look forward to its sunny creaminess on these bright Seattle days. Thanks for the recipe! Interesting.. Never tried mangoes with ginger. Will keep this on in the queue! 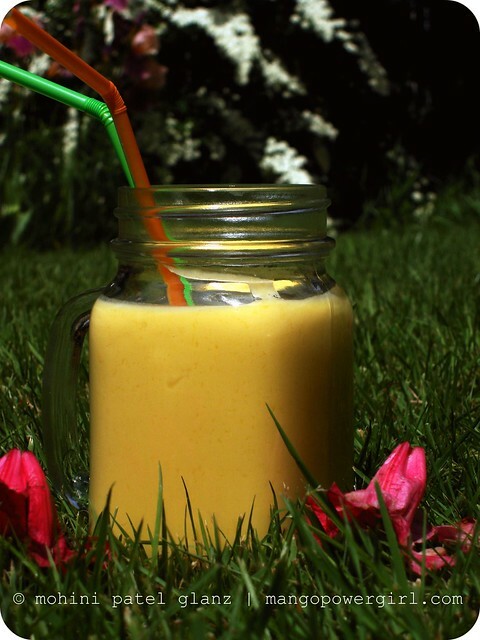 Thanks everyone, it is a perfect summer drink while mangoes are in season!Peter/Jude – In India we eat mango pulp or rus as a side dish and it always served with a pinch of ginger powder because it helps digestion and adds a bit of a zing! That was my inspiration in adding it to the lassi. yum. this looks so good and refreshing. ginger’s an interesting pairing. Philippine mangos will be best in this recipe!! I have 10 pieces in my fruit bowl right now. Darn…no yogurt in the fridge! wish you were down here in So Cal because i go this great exotic fruit store that has tons of great mangoes. These mangoes are imported from Thailand, India and Hawaii.But your drink sure does look so pretty, delicious and summery! I have been reading your latest posts and just wanted to tell you that your next to last picture (the set of 4) is just great. Describes a perfect summer mood! Eager to make this! For a banana lassi would I use the same amount of banana as mango?